There is nothing pretty or cutesy about this post. 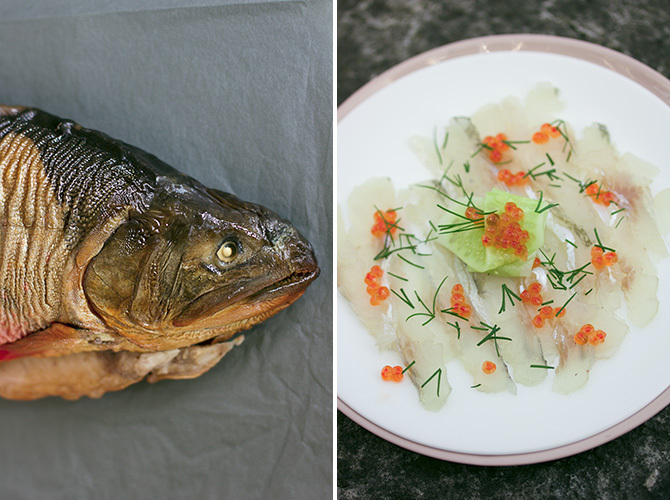 This post is all about fish. My grandfather used to smoke and can his own catch. Mostly it was smoked fish in oil or fish in aspic but sometimes meat chunks in jelly as well. My favourite was the tinned smoked eel but the smoked flounder was just as delicious. I have been holding on to the very last tin of smoked eel for very long. There will never be anything quite like it again. Even the eel itself is an endangered species now. The tin must be more than 10 years old, although I do not know the exact age. I discovered it was full of roe! I creamed it with a spoonful of Hollandaise and spread on thin slices of toast. Heavenly! 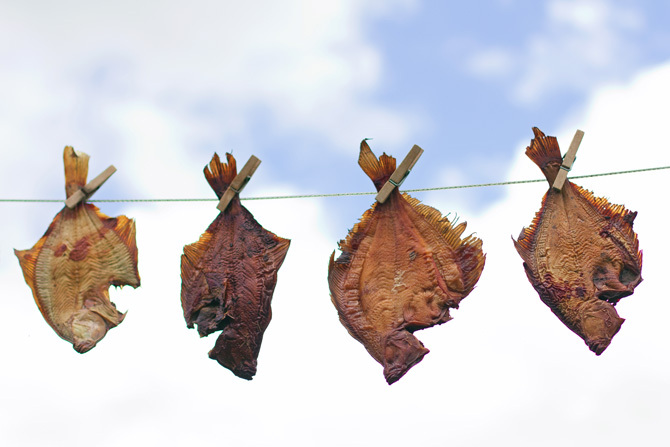 Smoked arctic char (Salvelinus alpinus) and thinly sliced raw lavaret (Coregonus lavaretus). For months I pondered whether it would be possible to replicate the canning process without all the special equipment. As sad as it is, we no longer have the autoclave, I think it broke some years ago. Then I read about using a pressure cooker for this task. It all seemed pretty simple and straightforward, except for the timetables. Europeans suggest much shorter cooking times than the Americans. Americans seem to be cooking the hell out of everything, the recommended time for smoked fish was around 100 minutes. Overkill? Germans suggest only 25 minutes. Wikipedia states that to kill the botulism bacteria you should cook the foodstuff at 121°C for three minutes. That means turning the pressure cooker on "high". Perhaps American pressure cookers are just weaker? Go figure. My first try at pressure cooker canning was back in May, using freshly smoked garfish. Considering that I am new to this, I opted for the middle ground and cooked the jars for 50 minutes. I think I left a bit too much headspace, hence the first jar seems only three-quarters full. One smoked garfish will give you enough to fill a 250ml jar. August - September is the perfect time for European flounders (Platichthys flesus) as they are getting plump and seriously fatty, whereas in spring they are rather bony and should be left in the sea to grow some flesh. 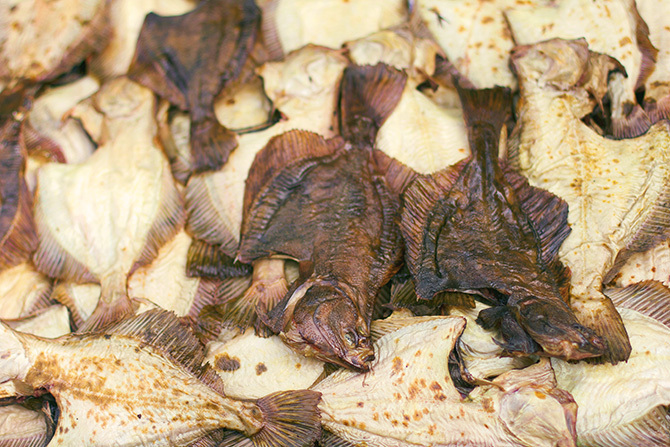 In the middle of August we ordered and received 5 kilogrammes of freshly smoked flounders direct from the fisherman. Ahh, the smell alone got me salivating (read, dribbling)! That's a good enough amount to try my hand at some more canning. First I cleaned the fish of all the extras - heads, tails, fins, backbones. It's fine to leave the smaller bones there as these will be cooked soft during the process. 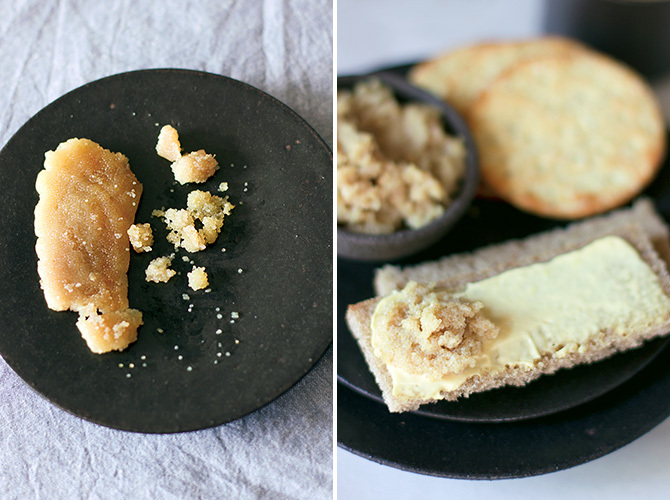 Now take your jars, I prefer Weck jars, and fill with about 1cm to 2cm of olive oil. Start adding the fish, try to be as compact as possible, use up all the space, don't leave any gaps. You should even press down on the fish, lightly, to make sure it is all snugly fit. Leave about 5mm of space on top, for clean seal. There is no reason to fill the jar entirely with oil, it will just seep out during the first minutes of heating. My grandma used to put only two tablespoons of oil per tin and it was fine. Place the lids on top of the jars and close with clamps. 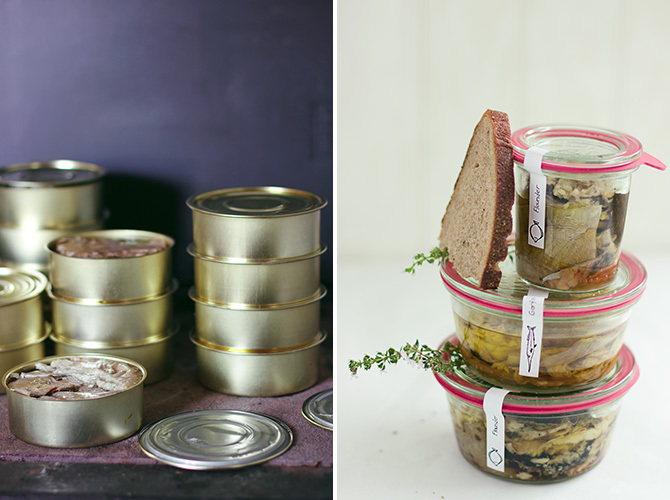 You could also use tins if you happen to have them. For tins you need an automated sealer. Place a rack on the bottom of the pressure cooker pot. Place jars on the rack and fill the pot with about a litre of water but it really depends on the size of your pot. Turn the heat on and let it all warm up without closing the pot. Once it starts bubbling, take the lid and seal the pot. Let it come to full power and then you can lower the heat slightly, letting it cook for 50 minutes (when using 250ml jars). Important, do not open the pot before the contents have cooled down, and this might take quite a few hours, depending on the size of the jars. If you do not have the patience, the pressure created in the jars might cause the contents to leek out, or worse, the jars might break. Let cool for at least 3 hours. I even let it cool overnight. One time I opened the pot after two hours of cooling time and the oil in the jars was still boiling, it was that hot! When using tins, the round flat ones, then you can stack these to make use of the whole pot. Next day, check your jars. It is important to take off the clamps, otherwise you will not know if the jar is safely sealed or not. If the tip of the rubber ring is pointing downwards, it is most likely sealed but it will not give you a 100% guarantee. Therefore you must remove the clamps and check if the glass lid is tightly closed. If, at any time, the lid on top becomes loose without reason, it is not safe to eat. This is truly inspiring, as preserving meats has always been on my to-do list. Sadly, I've never done it. My mother's pressure cooker is lonely and unused. Since we're landlocked here, and the "fresh" fish is a little iffy, I'm wondering if the same thing would be possible with chicken. Also, can I use the Ball and Mason jars that most folks use in our neck of the woods? Yes, with some alterations, poultry should be a good alternative. I'm planning to test different meats in spring. I would remove all the skin and sinew and perhaps brown the meat chunks over high heat in a pan before filling in the jars (extra flavour). If you don't mind the flabby skin then you can leave it on as it helps gelling and should add to the flavour as well. The cooking times would also be longer as the meat is raw. But when using smoked chicken or duck, then just pop it in, no hard work there. As for the liquids, I would use either rendered duck fat or concentrated chicken stock in place of the oil. Clip-top jars are preferrable but screw-top jars have been used as well. Use new lids, any lid that is even slightly bent or out of shape, will not hold. Also the lids should have the "safety button" in the middle to test the vacuum. Thanks for your answer, Zappie. Living in a remote area like we do, we're sometimes snowed/iced in for weeks or even months at a time. Knowing how to cam meats would be a big help in preparing for those long, winter days. 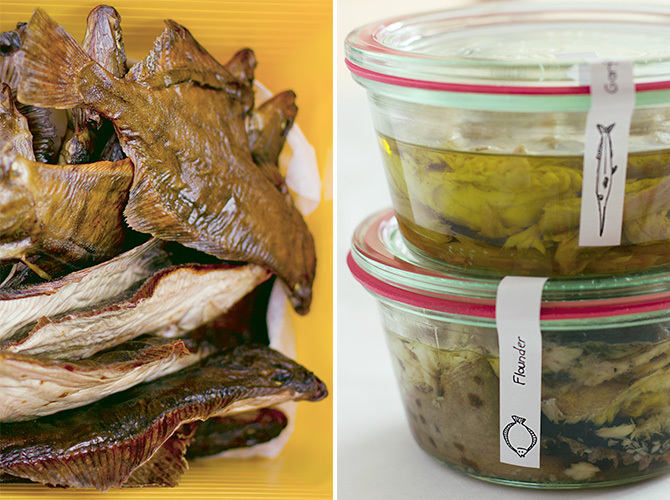 Really nice post - I equally blogged about my appreciation for smoked food (fish, in particular) recently, and I'm really glad I've fallen upon your inspiring post on the same subject. I plan to do some preserving too - though I feel your pain on the ambiguous information regarding the process. The Ripailles cook book has a good straight forward section on making preserved foie gras. As ususal, you have delightful pictures. Keep the nice stuff coming! Hola: unas fotos maravillosas pero no puedo entender la receta ya que no tienes traductor.